#SundaySupper and AmFam are partnering up again!!! I’m so happy to be a part of it this month, AmFam’s Back to the Family Dinner Table Campaign is being hosted by the wonderful Isabel at Family Foodie. They’ve selected 20 SundaySupper bloggers to take part in this event and we are all sharing “Meals made with Cheese!” Yup you read that right, Cheese! It’s so nice to see other families that feel the same way I do about gathering the family around the table each week. A lot of days that 30 minutes my family sits around the dining room table are the only 30 minutes my husband and I even get to talk. We have little ones right now and meeting up during that time provides me with some kind of comfort. Speaking of comfort, could they thought of a better theme?? Cheese is a huge comfort food for me. Whether I cut up a few pieces and have it with my favorite wine at night or if it’s warm, melted and ooey goey in a classic savory dish for dinner!! I love cooking with cheese and I do add it to a lot of things, here are a few things I’ve learnt along the way. 1. When cooking hot dishes such as soups or sauces, adding the cheese at the end of the preparation is the way to go! Or if your making a baked dish or casserole, sprinkling it on during the last 10 minutes let’s the cheese melt and crisp on top! That equals a happy recipe! 2. When cooking with cheese on your stove top you want to keep it at a low to medium heat, take the time to let the cheese really melt, cooking it on higher to save time can cause the cheese to separate and clump! 3. Adding cheese to a nice crisp salad can go a long way. So many people I know do not like blue cheese, goat cheese or feta but those are the best cheeses to on top of any salad out there!! What recipe does your family love that has cheese in it??? What is your children’s favorite cheese dish that you make??? I wanted to make something that had lots of ooey goey cheese in it! It has fresh veggies and you can have it for breakfast, lunch or dinner! I was tempted to add Ham to it and make it a dinner for my family and I, however I decided to have breakfast for the week for my me and my girl! Heat 2 teaspoons of the oil in a nonstick skillet over medium heat. Add the onions and saute until translucent and beginning to brown, about 4 minutes. Add the garlic and continue to cook for another 1 minute. Add remaining 2 teaspoons of oil in the skillet and saute the mushrooms for 5 min. Transfer the onion mixture to a medium bowl and allow to cool. (you don’t want to put them in the eggs warm or your eggs will start to cook!!) Spray an oval baking dish with cooking spray. Arrange the bread cubes in the dish. In a large bowl, beat the eggs, egg whites, milk and mustard until incorporated. Add mushrooms, onion-garlic mixture, broccoli, Parmesan and mozzarella cheeses, thyme, and salt and pepper and stir to incorporate. Pour mixture over bread, making sure liquid saturates bread. Cover with plastic wrap or tinfoil and refrigerate overnight, or at least 8 hours. Preheat the oven to 350 degrees F. Remove the plastic wrap/tinfoil from strata and bake for 55 to 60 minutes, or until top forms a light brown crust. Scoop and Serve! Oh and of course enjoy! If your looking for some great dishes to cook up around your #FamilyDinnerTable be sure to follow theirPinterest Board, check it out, it’s a great way to add a new recipe to your usual-regular go to meals! Change it up and go check it out. Below are some other great ways to connect with American Family Insurance. Now, let’s go see what the other 19 bloggers have shared with us for Meals made with Cheese!! Go get your cheese on! I’ve been wanting to make a strata for the longest time. After seeing how good yours looks it is giving me the nudge to make one. It was so super easy! Woke up, popped it in the oven and wala! Breakfast! This is my kind of dish. 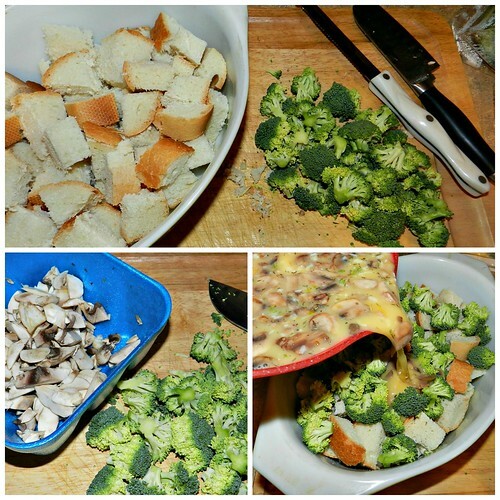 Love those veggies and thanks for reminding me to make a strata. 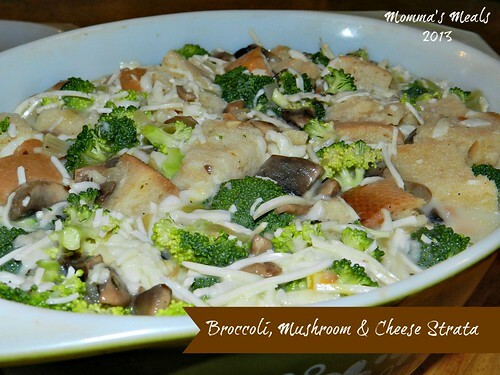 Broccoli and cheese are one of my favorite combos! Great minds think alike! I love broccoli on my pizza too. I would eat your strata for breakfast, brunch, lunch and/or dinner! Perfect dish! Goat, blue and feta are totally the best for salads! 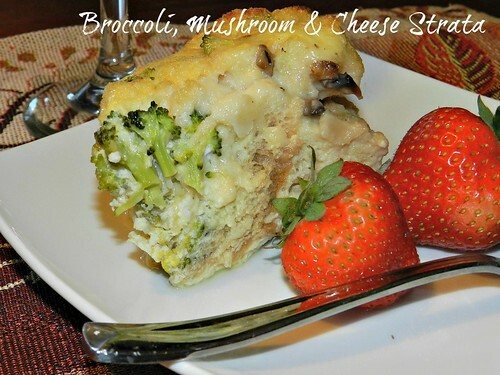 And your strata looks awesome – many of my favorite ingredients! I adore stratas and yours is a winner with all the yummy veggies and cheese! Stratas are my families favorite things to have for holiday brunches…and this one may just make the menu this year – it looks amazing! It’s great for brunches, I made it for my husband for a Father’s Day brunch last year! This is the perfect make the night before dish! The veggies look great and what is not to love about cheese?! Yum! Oh yes! I have been wanting to do something different for breakfast and I just so happen to have a little head of broccoli that I need to use!! Mmm love mushrooms and broccoli! Looks like an easy and delicious meal. Sounds like breakfast to me! Gotta love broccoli and cheese! Yum, I just love strata! I usually make them for Christmas morning. Delicious recipe! Strata is one of those dishes that I forget about, but I shouldn’t savory bread pudding, I mean come on! This looks so good and needs to be made soon. Wow! This sounds amazing–I may have to make it this weekend!